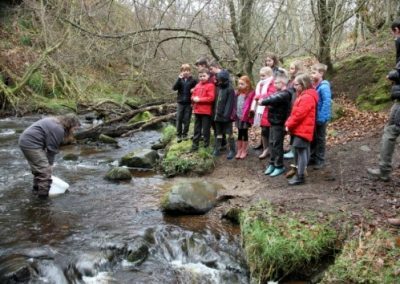 The FISH IN THE CLASS project ran over the last 8 weeks, 400+ pupils at 14 schools spread throughout the Forth River catchment have been hatching brown trout eggs and rearing the young fish to the fry stage. 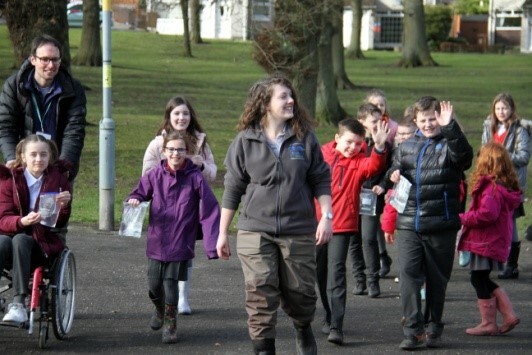 The successfully reared trout fry were now ready for release into the local streams and burns. Release day involves catching the fish in the tank and sharing them out between the pupils. Each pupil gets a few fish to carry to the release site in a small zip-lock freezer bag. A ten minute walk in the fresh air takes us to a carefully selected safe and accessible stretch of riverbank. 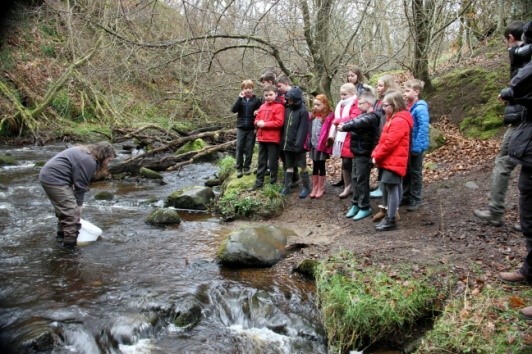 The class splits into two, one half places their fish in a bucket containing river water allowing the small fish to acclimatise before being gently released into the stream. Some of the pupils had lists of names for each of the fish; these were read out load as if it were trout graduation day. 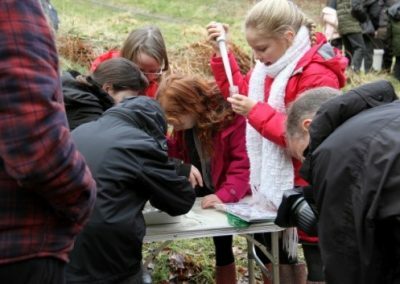 The other half of the class takes a close look at the invertebrates (Bugs) that have been collected from the riverbed normally by members of the local supporting angling clubs. 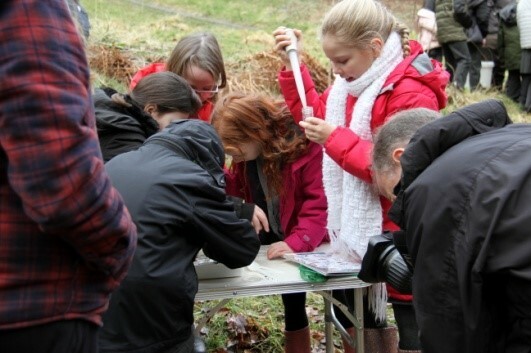 We swap over then demonstrate the kick sample process which is the method used for collecting the invertebrates. 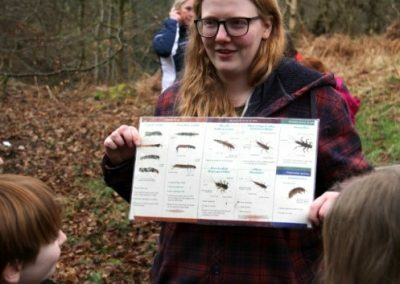 Most of the pupils are intrigued by the strange looking creatures gathered in the sample trays; others are a bit more wary. 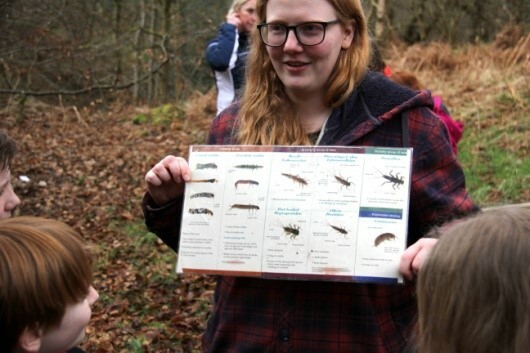 Mayfly, caddis, stonefly and freshwater shrimp are the norm along with various worms and snails. Small fish also appeared in some of the samples, stickleback, stone loach, minnow and bullhead. Occasionally we were graced with the presence of a small beautifully marked brown trout. 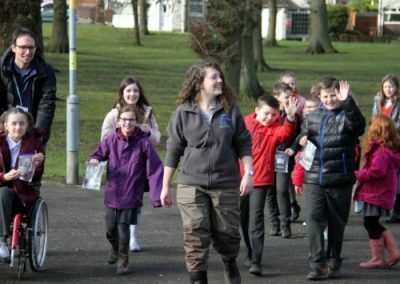 With the fishy farewells complete and one final fantastic rendition of one, two, three, four, five performed by the nursery school its back to the classroom with everyone involved far more aware of the wonderful creatures that live in their local stream and what they require to thrive. March 27th saw the final fish released at the end of what had been a very successful project. Really positive feedback from pupils, teachers, parents, volunteers and helpers alike leaves us looking forward to FITC 2020. 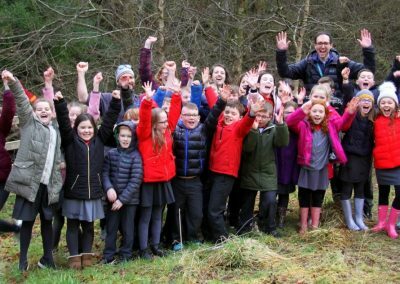 We even managed a slot on the STV news!